# Chop the onion, sauté over medium heat until it turns pink. # Add ground meat and stir. # When the ground meat gets cooked add tomato paste, then sliced peppers, and then the tomato, drizzle salt. # When the ingredients get cooked, make spaces on the skillet for breaking the eggs. # Break the eggs onto these spaces and drizzle crushed red pepper on the yolks. 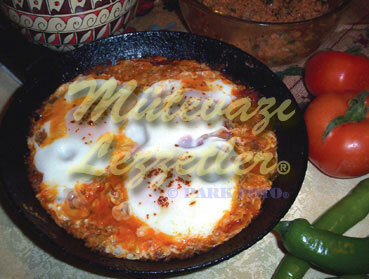 # When the eggs reach the right consistency remove from the stove and serve hot. Note: For preventing the eggs become hard, you must cover the lid of skillet.